Team Registration: Team captain must register team no later than 3 days from completion of the District Championship. Completing this process officially registers your team and notifies tournament officials that your team will be participating. Click on the link for the appropriate event above for additional information and to register your team. Registration confirms that your team is participating at Sectionals. Team Eligibility: Each team must have a minimum number of eligible players to compete at the Sectional Championships. USTA League Regulation 2.03A(5). Note: Teams that do not have the minimum number of players required at the start of tournament are subject to a Championship Grievance being filed by the Championship Committee. 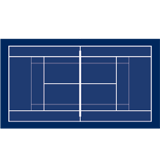 USTA Memberships: Memberships must be current through the last day of championship play. Be sure to check memberships and renew as needed.